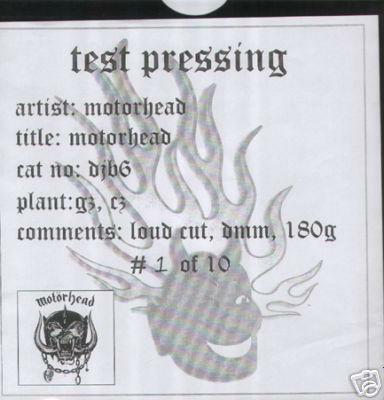 According to a seller on Ebay only 10 test pressings were made of this. The test pressings were made on 150 g vinyl instead of the 180 that the stock copy were made of. Each copy has an individually numbered insert. The sleeve is a thick black die cut sleeve. The insert has a Devil Jukebox logo on as well as the Motorhead skull. They have white labels with red ink Devils Jukebox stamp on one side. There were also made 10 test pressings for the grey bonus 12" that was included with the first 100 copies. The test pressing of this was made on black vinyl and was also packaged in a black die cut sleeve with an insert. This insert looks almost the same as the LP insert but instead of the Motorhead skull it has a small picture of the original picture inner sleeve. Also individually numbered, also with white labels with a red Devils Mark ink stamp on one side. GBP 109 April 2008, Ebay (LP, no 1), GBP 52 May 2008, Ebay (LP, no 3), GBP 16 November 2008, Ebay (LP, no 4), GBP 92 April 2008, Ebay (12", no 1), GBP 32 May 2008, Ebay (12", no 3), GBP 19 November 2008, Ebay (12", no 4), GBP 50 (LP, no 5, probably 12" no 5 as well for GBP 50), December 2008, Ebay (buy it now), GBP 50 (LP, no 8, probably 12" no 8 as well for GBP 50), December 2008, Ebay (buy it now).